We have developed two models of CENTUM VP I/O modules dedicated for turbomachinery controls, so that CENTUM VP will be capable to perform the high- speed turbomachinery control actions which are almost impossible by the legacy products of DCS (Distributed Control System). By installing these modules in CENTUM VP platform, a CENTUM VP system can be used as a high-speed turbomachinery control system with the same reliability that the legacy distributed control systems of CENTUM series have been reputed for. Moreover, since the sales of new modules is carried out along with the sales of DCS systems, the current engineering and maintenance services can be fully utilized for the services of the turbomachinery control systems. This paper will introduce the typical features of the turbomachinery control applications integrated in the CENTUM VP systems and the features of the above I/O modules dedicated to the turbomachinery controls. 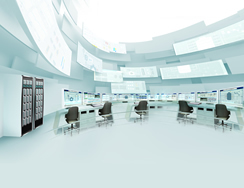 To date, Yokogawa has focused on DCS (Distributed Control System) which control the entire power generation plant, including boilers, in the electric power industry. In contrast, turbomachinery control has been handled by turbine manufacturers, but as the electric power market has been active internationally, especially in China and India, in recent years, Yokogawa has been developing turbomachinery control systems to to further develop the electric power industry. A mechanical control unit incorporated in the turbine main unit was the precursor of turbomachinery control systems, which have continued to be manufactured by turbine manufacturers even though they are still based on EHC (Electro-Hydraulic Controller) or DEHC (Digital Electro-Hydraulic Controller). However, this causes the problem that different hardware is used between turbomachinery control systems and power-generating plant control systems. Yokogawa has therefore developed turbomachinery I/O modules that can be implemented in the new integrated production control system, the CENTUM VP platform. These I/O modules integrate DCS and DEHC features and so can monitor and control the entire power generation plant including turbomachinery control in a unified hardware environment, with the equivalent reliability as the reputable CENTUM series (Figure 1). This paper describes how turbomachinery control is integrated in the CENTUM VP and introduces the functions of the new turbine dedicated I/O modules. Figure 1 shows an example of the configuration of the turbomachinery control system on the CENTUM VP platform. The system 1 in the figure is a turbomachinery control/ protection system in which turbomachinery I/O modules (AGS813 and AGP813) developed this time are installed in the CENTUM VP's field control station (FCS). It actually performs turbine revolution speed control and interlock. The system 2 in the figure handles control over boilers, auxiliary equipments, etc. and has long been handled by DCS. In addition to these systems, the turbomachinery control system consists of a Human Interface Station PC (HIS), Engineering Station PC (ENG), and Sequence of Events Server PC (SOE server). 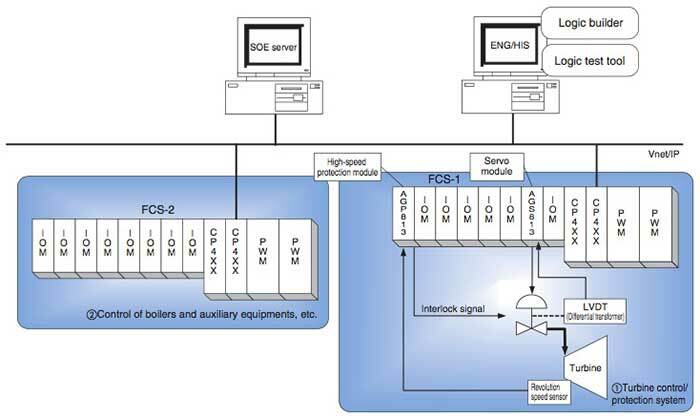 The FCSs and ENG, HIS, and SOE server are connected by a real-time network system and linked via Ethernet (V-net/IP). It is configured so that all features, including control of boilers and auxiliary equipments and a turbine control/protection, are integrated on the same CENTUM VP platform. YOKOGAWA have developed two models of CENTUM VP I/O modules dedicated for turbomachinery controls, so that CENTUM VP will be capable to perform the high-speed turbomachinery control actions which are almost impossible by the legacy products of DCS (Table 1). One model is AGS813, a servo module for controlling the servo valve opening. Another model is AGP813, a high-speed protection module for sending high-speed emergency interlock outputs. 4 to 7 Vrms 4 ch. 24 V DC contact 2 ch. Turbine revolution control is achieved by controlling a regulating valve that hydraulically controls a steam flow rate in the case of a steam turbine or a gas flow rate in the case of a gas turbine. 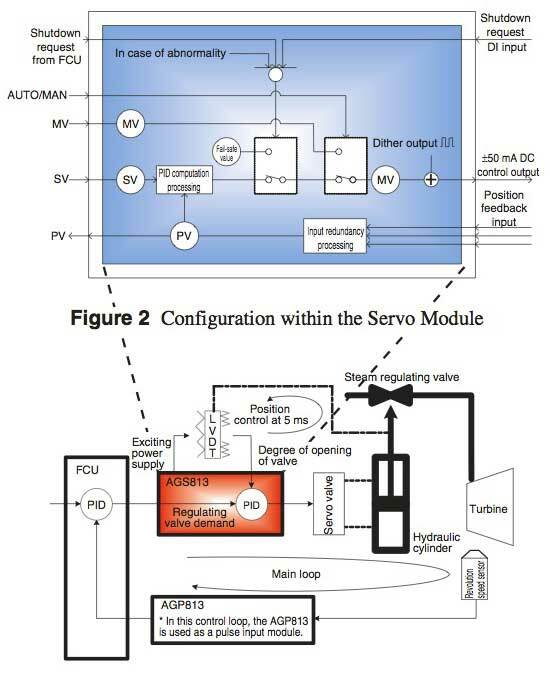 The servo module can be used to perform the high-speed position feedback control of the regulating valves based on the manipulated outputs and the valve openings calculated by the supervisory system (DCS)(Figure 2). Table 2 shows the main specifications of the servo module. Figure 3 shows an example of the configuration of the turbomachinery control loop. The degree of opening of the valve is independently processed by the I/O modules, enabling it to be controlled at high speed (control interval of 5 ms). The main loop is controlled by the CENTUM VP field control unit (FCU). The servo valve driving circuit capable of handling LVDT inputs, exciting power supply, and positive and negative current output, or the dedicated input/output function required for valve opening-degree change control of the servo valve, has been installed in all the I/O modules. This module internally implements the logic that can be set by the user. Thus, it can easily realize high-speed processing of protection logic, such as over-speed trip and power load unbalance, which are essential features for turbomachinery control. Table 3 shows the main specifications of the protection module. This module executes a series of computation processing based on a signal from the turbine in accordance with set logic and outputs the results to the field. Furthermore, the set values can be input from an FCU to the logic or the FCU can be notified of internal logic data. The I/O module independently executes protection logic in this way; it can process it at high speed (control interval of 5 ms) and can also easily be linked to function blocks of the FCU. As a speed sensor that detects turbine revolution speed, the AGP813 supports both inputs of MPU (magnetic pickup) and active pickup on the same channel and can receive various pulse signals from the speed sensor with high accuracy. The I/O modules can be registered and setting items can be defined by using the CENTUM VP engineering function and then downloaded via FCU. 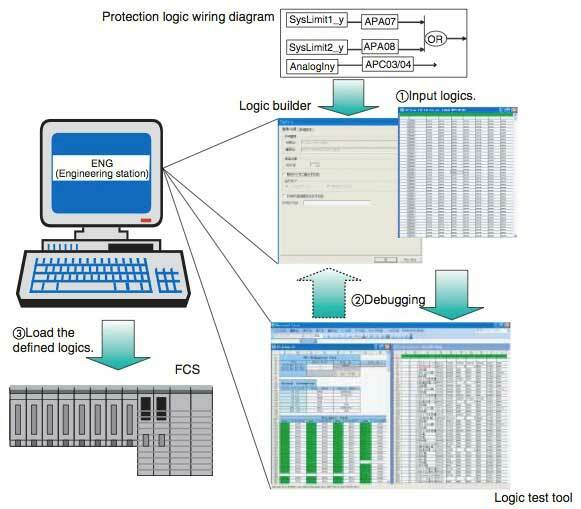 AGP813 protection logic can be defined using the newly developed logic builder in the ENG (Engineering station), and defined protection logic can be debugged using the logic test tool in the ENG (Engineering station). The logic test tool can run the same protection logic as processing performed in the AGP813 on the PC. This enables the engineering contents to be efficiently verified. Figure 4 shows the flow of engineering on the AGP813. Data exchanged between a turbomachinery I/O module and FCU includes a mixture of multiple data types, such as data input/ output from/to the field, PID control status in the I/O module, protection logic variables, etc. Therefore, data is exchanged between the I/O module and FCU via the communication input/ output area, so that a wide variety of data can be handled flexibly. Figure 5 shows the data flow between the FCU and turbomachinery I/O module. The function blocks in the FCU can easily accomplish a shutdown command to the I/O module, AUTO/MAN switching, or function block tracking action by combining themselves with communication input/output data. Input/output values or internal states of the I/O modules are stored in the function blocks of the FCU via the communication input/output area, which can be referred to from the HIS. Moreover, diagnostic information of the I/O modules themselves can also be conveyed to the HIS via the communication interface. Therefore, the HIS can perform turbine status monitoring, alarm monitoring, and instruction operations in the same way as the reputable CENTUM series. In addition, the AGP813 has the SOE function, and the interface with the high-level system is fully backward compatible with the existing SOE function interface, enabling events to be acquired in the existing SOE server. The turbomachinery I/O module performs turbomachinery control independently in the I/O module. Thus, if the I/O module fails, turbine controllability is lost, with major consequences. The turbomachinery I/O module developed this time enables dual redundancy (standby redundancy system) to avoid the impact of an I/O module failure. The turbomachinery control and standby I/O modules independently perform control computation inside themselves to achieve high-speed control. 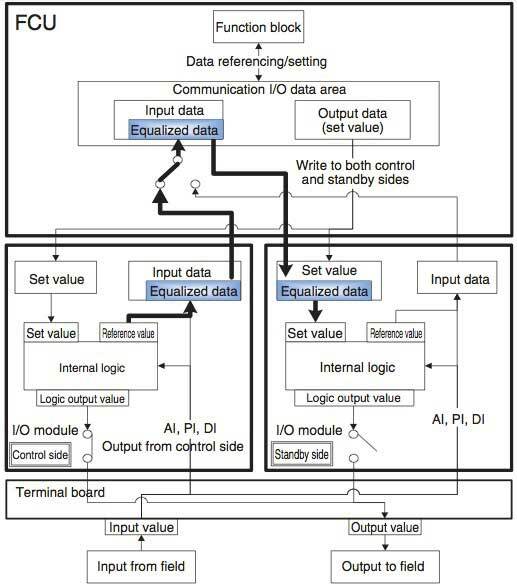 Because the control and standby I/O modules operate independently of each other, there are differences in the computation results between the control and standby modules due to a difference in the acquisition timing of input signals from the field. This may cause the output value to bump upon switching the control right. 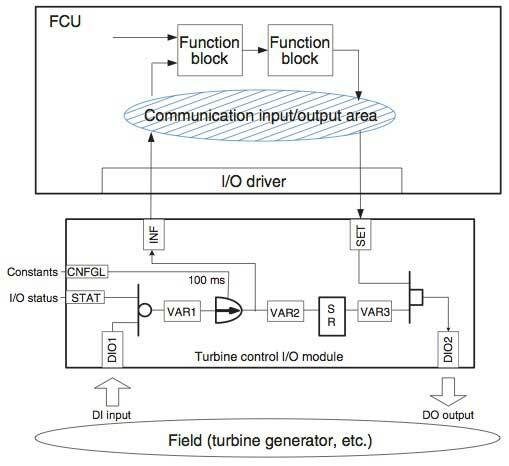 As shown in Figure 6, the newly developed turbomachinery control system has a mechanism in which the FCS reads the output value and internal status of the control I/O module and makes the standby I/O module match them. At the instant when dual redundancy switching occurs, the FCU outputs equalized values and then switching is made to output internally controlled by the module. This dual-redundant mechanism enables bumpless high-speed switching, ensuring high reliability. This paper has introduced the features, etc. of the turbomachinery control system for the CENTUM VP. Yokogawa has developed a servo module and a high-speed protection module as turbomachinery I/O modules and has developed the turbomachinery control system on the CENTUM VP platform. A range of new high-speed I/O modules will be added using this platform for deployment to the high-speed control field (electric control and servo systems) which is difficult to accomplish by conventional DCS. Ronald Hitzel and Fred Block, "Retrofitting Steam Turbines with Modern Control Platforms," Power GEN 2003 – Las Vegas, SIEMENS, 2003, 16p. 'CENTUM' is a registered trademark of Yokogawa Electric Corporation. 'CENTUM VP' is under patent pending. Other product names and brand names in this paper are trademarks or registered trademarks of respective holders.